Funded by Diabetes UK and the Northumbria University Strategic Investment Fund, it is the first ever study which has found a way to completely avoid these dangerous falls in blood glucose – termed hypoglycemia – that occur after exercise. The research has been shortlisted for the Lilly Diabetes Clinical Science Poster Award at the 2015 Diabetes UK conference this week. Anyone can experience hypoglycemia, but diabetics are particularly vulnerable. This is because exercise alters the body’s sensitivity to insulin and accelerates its effect. When this happens to a diabetic person, their blood sugar is used up too quickly which means it can rapidly drop hours after exercising – particularly during the night when it is most dangerous. 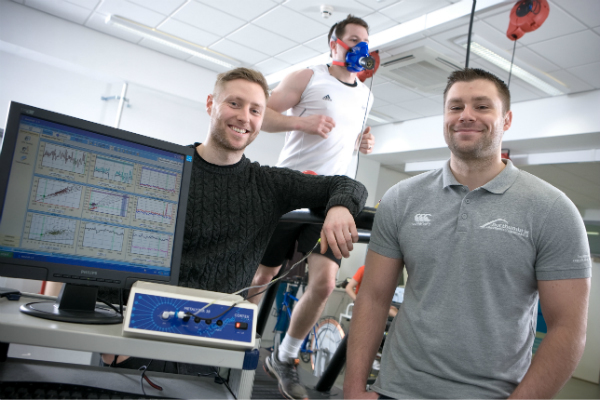 Dr Dan West, a Senior Lecturer in Sport, Exercise and Rehabilitation, and his PhD student Matthew Campbell who is now a Senior Research Associate in the department, set out to test whether altering diet and insulin doses could help to prevent this potentially life-threatening problem. “For diabetes sufferers, the fear of experiencing a dangerous blood sugar dip after exercise can prevent them from exercising altogether – which has both physical and psychological implications,” explained Dr West. Their two-part study, which was carried out at the Royal Victoria Infirmary’s National Institute Health Research (NIHR) Clinical Research Facility in Newcastle in collaboration with Professors Mark Walker and James Shaw looked at the effects of adjusting slow-acting insulin levels in a group of 10 male participants with Type-1 Diabetes. Blood sugar levels were monitored using a continuous glucose monitor which sits underneath the skin and has an alarm which is trigged if levels begin to fall dangerously. In the first test, all participants took a normal slow-acting insulin dose and then completed a 45minute exercise session at 6pm in the evening. Around 7-8 hours after the exercise, 90% of the patients experienced a blood sugar dip, all of which occurred whilst they were sleeping. During the second test, the insulin dose was reduced by 20% and participants took part in the same evening exercise session. This time, however, none of the participants suffered from drops in blood sugar. Unexpectedly, the study also found that the 20% reduction of insulin not only prevented blood sugar from falling but also stopped glucose levels from rising too high. With this dose, levels remained within the ideal healthy range, and other important markers such as ketones and inflammatory cytokines were not affected. This is particularly important finding as clinicians are often reluctant to change treatment regimens because of potentially exposing patients to these consequences. The results will be presented by Matthew for the award at the Diabetes UK conference which is being held at London’s Excel centre between 11-13 March. Northumbria’s Sport, Exercise and Rehabilitation department has a big presence at the conference, with six abstracts to present. Matthew explained: “I am confident that our research will be well-received at the conference. We are offering a pragmatic approach to a highly-relevant clinical issue, which is supported by robust scientific research”. The prize money would be used to help further this research and move towards incorporating the findings into clinical practice. The researchers now intend to look at the education of patients who want to exercise and research the impact this could have on people’s lifestyles. Posted on 24 March, 2015 by Federation of Holistic Therapists (FHT). This entry was posted in health and tagged health. Bookmark the permalink.